Solar Fire Chart-File Search gives you a powerful and quick way to locate all charts in a given category. It can search through hundreds or even thousands of charts and pull out charts with virtually any kind or combination of astrological signatures. These range from a simple planet, asteroid, hypothetical body or house cusp in a given sign on up to any of 25 multi-planet aspect patterns (t-squares, grand trines, yods, heles, rosettas Thor’s Hammers, grand quintiles and more). You can search for two points in a given phase relationship, a point that is in aspect to any specified zodiacal position, or a point at, above or below a given longitude, latitude, right ascension, declination, azimuth, altitude or speed. In addition, the Chart Search offers a rich selection of classical criteria — 7 types of horary consideration; any point that has a given dignity, ruler or almuten; or the ruler, almuten, antiscion or contra-antiscion of a point being a specified planet or having a specified dignity. You can also search for any word or character string in the chart comments, making it possible to see whether people who have similar life themes have similar charts. Or you can look for astro twins by searching for similar birth dates, times and Ascendants. Or search on “days to birthday” to find clients who are soon due for a solar return reading. Besides searching for hundreds of single criteria, you can use “And/Or/Not” connectors to combine any number of criteria, and you can save these complex criteria files for future use. By enabling you to see how astrological principles actually work out in practice, Solar Fire 6’s new Chart Search is guaranteed to broaden and solidify your astrological knowledge. New Electional or Time Search lets you specify criteria similar to those in the Chart Search. Solar Fire 6 then lists all time periods when these criteria are in force. This helps you find the optimum time window for starting a project. It also makes it easy to find all periods in history that have a specific combination of astrological conditions. Aspect highlighting is an enormous help in making sense of the aspect lines in the center of the wheel. Earlier Solar Fire versions enabled you to color-code aspects. Now you can also specify increasingly wide lines as an aspect approaches exactness, and dotted lines when an aspect separates. In a natal chart, this makes the most important aspects really stand out. In the animated chart, it dramatizes each aspect’s build-up, perfection and separation as the planets move forward in time. Aspect filtering lets you temporarily cut out the kinds of aspects that you’re not looking for so that the patterns that you are looking for stand out clearly. You can filter out all aspects beyond a certain orb, all separating aspects, all soft aspects, all aspects that don’t involve a specified planet or harmonic, etc. — even all aspects that aren’t part of any of the 21 specific aspect patterns that Solar Fire 6 can recognize. Whether you’re viewing a chart wheel, aspect grid or animated chart, it’s very easy to turn the filter window on and off and to switch to from one filter to another as the need arises. Life-event storage. Besides storing chart comments, you can now store unlimited life-event times, places and descriptions with any natal chart. Gives you a convenient place to store this info, and keeps it instantly ready for casting transiting, progressed and directed charts for life events without your ever having to re-enter the event data. Also, in the animated chart view, you can click on any event and jump right to its exact date and time. Chinese Charting. Detailed or short tables give the Chinese lunar mansion of each point in the chart. There’s also a Year Pillar table that is correctly calculated for each lunar-based Chinese year. This gives the birth year’s animal, Chinese element and yin/yang polarity. Chart Preview makes it easier to find the chart that you’re looking for. When you click on a calculated chart or you select a chart in your files, Solar Fire 6 instantly displays the whole chart in a small but readable wheel design of your own choosing. Void-of-course Moon periods are now an option in Solar Fire’s powerful dynamic hitlists and Time Maps. It’s easy to print out a handy list for reference during the coming week, month or year. You can even mix Void periods in the same list with other considerations like retrograde periods, lunations, planetary ingresses and transiting aspects. Age-Harmonic Charts are an innovative and potentially powerful technique to add to your forecasting repertory. Solar Fire 6 lets you instantly cast a harmonic chart based on a person’s exact age down to the day, hour and minute (or the age plus 1 year). You can then see transits to this chart in Solar Fire’s dynamic hitlists and graphs. Declination/latitude options include graphic declination and latitude strips in page designs; new Longitude Equivalent Declination charts (a Charles Jayne-inspired technique that converts the longitudes of every chart point to the longitude that the Sun would be in if it were at that declination); and (also as recommended by Charles Jayne) directions (as well as transits and progressions) in declination or latitude both in the dynamic hitlists and directed charts. 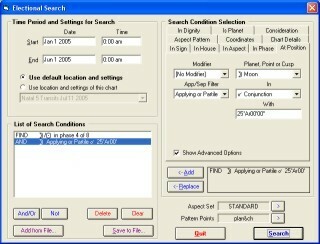 Precision to the second of arc for all standard chart points is an option in tables and ephemerides. This precision is realistic, given Solar Fire’s state-of-the art Swiss Ephemeris accuracy. New direction options: Besides offering solar arc and other directions not just in the usual longitude but also in declination or latitude, the dynamic hitlists now include Van Dam primary directions (in addition to the existing mundane primaries). Also, both the hitlists and the directed charts now include solar arc and other directions in whole, half, double or reverse arcs. Animated Chart has a fully functioning dial pointer. Also, it now lets you view pop-up interpretations, export calculated charts, and jump instantly to the regular chart screen. Graphic ephemerides now have handy Forward and Back buttons that let you scroll through time as far as you wish without exiting from the graph screen. Also, you can now see a readout of the precise degree, date and time represented by the cursor’s position on the graph. And, just as you can do in the hitlists, you can now have graphic ephemerides showing half, double or reverse arc directions, and directed (as well as transiting and progressed) declinations. You can create graphic ephemerides in any modulus you wish, and if you want to insert the graph into a word processing or other document, you can right-click to send it to the clipboard or save it as a file. Calculations for 1,000 extra asteroids from 5401 BC to 5399AD. These are from the state-of-the art Swiss Ephemeris, and estimated accuracy is to a few minutes of arc in 3000 BC. Besides bodies in the asteroid belt, these extra points include a dozen Centaur-class asteroids and the newly discovered Sedna and Quaoar. You can select any of these bodies to appear in extra-points wheel rings and tables for any chart. You can also include them in dynamic hit lists, time maps, graphic ephemerides and table-style ephemerides. It’s possible to use older Solar Fire charts — and now even Nova-style charts — directly in Solar Fire 6 without having to convert or import these charts. However, if you do want to attach life events, it’s very easy to convert charts to Solar Fire 6 format. For extra safety, Solar Fire 6 automatically places a backup copy of your old charts in an OldCharts folder. (as well as progressed and directed) can now not only be calculated, but also saved to your files. Enables Solar Fire to list chart points in whatever order you prefer. Now you can begin every point list on the screen and in printouts with either the Sun or the Moon (or the Ascendant or any other point you wish). Input data for as many natal or subsidiary charts as you wish without exiting from the calculation window. A great time and keystroke saver!